Microsoft is developing some tactics that I find shady. It began with a software update to Windows 8 where it started to advertize an upgrade to Windows 10, right in between necessary security fixes. Once I installed Windows 10, it started to install apps that I never asked for, put ads for others apps in my Start Menu. Solitaire now has in-app purchases. I really don't need Candy Crush. I have uninstalled Get Office, Get Skype, Solitaire Collections and all of the MSN apps a number of times. Microsoft shoves them back on to my computers and does not respect my decision. I am no longer confident that Microsoft will respect other decisions I made. Now I am receiving push messages advertising Office 365. Classy, Microsoft. Really classy. I have a similar reaction to the way they market directly to our end users in Office 365. We've been hammering them on that for almost a year. It's been improving lately. To me it looks nothing but desperate. I suspect the thought process is that if you're getting the OS for free, they have the "right" to try to push you towards their paid offerings, which offsets the free. That may be the thought process, but it's wrong. You get the OS for free because Windows is slipping. Microsoft could play this classy. But unfortunately that is not the case. Plastering ads all over the place is ... I don't have a word for it. Like the opposite of classy. @Amy: In my opinion it's not that easy. If MS chooses to pay for the OS by unwanted advertisement, MS needs to tell that in advance. @Vowe: My Windows 10 spares me from advertisements right now. ... Maybe it's a data privacy Setting? I have cortana activated though. So my Windows isn't too private. ;( It would be funny to find out what MS does, if you disconfirm the use of data for means of advertisement. legally MS isn't allowed to connect that kind of confirmation to the use of windows. I think you can turn it off somewhere. But I'm back at Win8 already and can't search for it now. Haven't seen that yet and I've uninstalled something called "Get Office" from the start menu (may be that's what Lukas was thinking of?). Also just uninstalled all the games from the start menu. Maybe because Surface 3 runs Windows 8.1 and not Windows 8.1 pro. This edition was formerly called 'Home'. So it maybe targets another audience then Vowe? It is still not Ok. But, hey, it's Home Edition. In my test lab two Surface pro 3 run since 2 month without such obtrusive behavior. Last week I got my first Surface 3 for testing. Good device. Maybe a bit slow if used beyond office. But the first thing I had to do was buying a Pro Pack. For enabling the possibility to join a domain. For Vowe, the one man think tank, it's for sure ok to use a Home Edition. But for the majority of the rest of us this problem is (hopefully) not relevant. Get Office, Get Skype, and the other culprits come preinstalled (aka provisioned) on Windows 10. Provisioned appx packages are part of the Windows image. As such they are not only part of the free upgrade. They are part of all applicable Windows editions, including OEM installs and versions you buy online or on media. Every time you upgrade to a new version - like the various insider previews - the provisioned apps are back. The only way to avoid that, would be to install from a custom image with the apps removed. You can do that with PowerShell or dism - I'd recommend PowerShell. PowerShell let's you also remove the provisioned apps from the Windows currently running. If you do that often, write (or google for) a script that uninstalls the unwanted apps. Once you have a script, getting rid of them is a matter of seconds. And, yes, the ads make Windows look cheap. They are the digital version of the various stickers on Windows machines. Best explanation, as always. Thanks, Max. Max, that's both easy and more complicated then it needs to be. If I could use "remove-appxpackage Microsoft.BingFinance" to throw out the unwanted app, that would be a short script. Unfortunately I need to use "remove-appxpackage Microsoft.BingFinance_4.4.200.0_x86__8wekyb3d8bbwe" to get rid of the app. And I am pretty sure that this string is nicely salted to make this kind of effort difficult. Get-AppxPackage/Remove-AppxPackage will only uninstall the app for the current user. That's also helpful for apps that don't have the uninstall option in the context menu (yes, that exists...). Get-AppxProvisionedPackage/Remove-AppxProvisionedPackage will remove the provisioned app from the current installation (so it doesn't reappears when you login with a new user or refresh your machine) or your install/recovery media (so it doesn't reappears when you install, reinstall or recover your machine). The problem is every time you have a new install media you need to remove the provisioned apps again. They are quite sticky - as you know. Customizing install media is something you'd normally only do for an enterprise deployment. 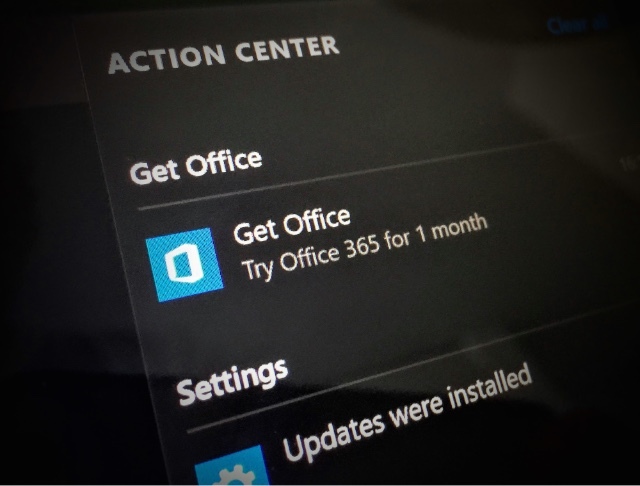 Being the only means to permanently get rid of something like 'Get Office' is IMHO a curious choice by Microsoft. Tip: What works well is the -Confirm parameter. e.g. Lets you choose for each app if you want to keep it or not. I was actually wrong about that. The problem are not the provisioned apps, or they shouldn't be. In Windows 8.x, provisioned apps are only a problem when you sign-in in multiple machines without a Microsoft Account. Then on every new machine you get the provisioned apps installed, again and again. With a MSA, your installations, or more important, the uninstallations are synchronized. So, even when an app is provisioned, if previously uninstalled it won't install again. Windows 10 doesn't sync app installs (yet???). And that's the problem. Every time you sign into a new machine, or reset your PC, or upgrade you get the provisioned apps installed and need to uninstall them again, and again, and again,.... That's really, really bad. I can't believe that there aren't more complaints about that. But then, I didn't catch it either. I only use one PC with Windows 10 so far. Anyway, I keep getting the annoying "Windows 10" upgrade popup message on a computer running windows 7. I am holding off on the upgrade until the client site I work on, gives it the all clear, which will be months. So, I discovered that the "Upgrade to Windows 10"/"Reserve you copy for windows 10" works EXACTLY like malware from a previous windows update that was ambiguously described so you would unwittingly download it as a normal windows "perforamance update".